The renaming of a store is usually seen as that store's demise. Before May Co. and Macy's owned Marshall Field's, they were owned by Dayton-Hudson Corp in Minneapolis, which also owned the regional department store, Dayton's, as well as Target discount stores. 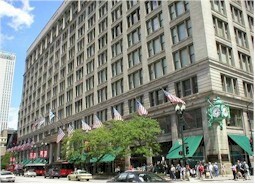 Dayton-Hudson had acquired Marshall Field's in 1990. In 2000, Dayton-Hudson changed their corporate name to Target Corp and in 2004 sold MF to May Co. A lot of loyal MF customers were upset when it was announced that the Marshall Field stores would be re-branded as Macy's....ah, love those Frango mints!! They were owned by May Department Stores, headquartered in St. Louis, where their flagship store was Famous-Barr. About ten years ago, Macy's bought May Department Stores and converted all their stores to Macy's.